Manhattan may be fairly compact in size (measuring just 13.4 miles long, by 2.3 miles wide), but it's positively jam-packed with head-spinning diversions and world-class attractions. Happily, uncovering some of this famous isle's best-known treasures is easily done on foot, and pounding the pavement is a beloved pastime for native New Yorkers and visitors alike. Here, we've rounded up 5 great walks in Manhattan that hit up some of its most iconic sights. So, lace up your shoes and get ready for an only-in-New York City stroll of a lifetime. Revealed as a veritable engineering feat of the times back in 1883, NYC's beloved Brooklyn Bridge, connecting the boroughs of Manhattan and Brooklyn, has been wowing crowds with its architectural elegance ever since. Crossing its just-over-a-mile-long span on foot is an NYC rite of passage, and the initiated are rewarded with some of the very best skyline, East River, and New York Harbor views in all of Manhattan – and Brooklyn, too. Access to the bridge on the Manhattan side is found Downtown, just across from the northeast corner of City Hall Park, from along Centre Street; the span crosses over the East River to connect to Brooklyn, in that borough's Downtown/DUMBO neighborhoods. Open to cars, too, you'll stick to the pedestrian walkway, though note that that path is shared with cyclists, too, so take heed of their dedicated lane, which is only separated by a line painted on the ground. Be prepared to be in good company: The NYC Department of Transportation estimates that more than 4,000 pedestrians cross the bridge in all on a daily basis. Give yourself about 30 minutes for the crossing if you're walking at a fast pace, though note that most first-timers will take closer to an hour, to stop and take in the views and snap some pics. Once you get to the Brooklyn side, you can simply turn around and walk back again, or exit at one of two points where you can hop on a subway to return to the Manhattan side of the river. The DUMBO exit offers access to the F train at York Street or the A/C trains at High Street; the Downtown Brooklyn exit is close to the A/C/F/R trains at Jay Street-Metrotech, the 4/5 at Borough Hall, or the R at Court Street. Of course, you can (and should) also opt to stick around to explore Brooklyn, too, before making your way back to Manhattan! Central Park, the lungs of Manhattan, marks a beloved urban oasis of nature and rejuvenation for any New Yorker. Encompassing a vast 843 acres, and filled to the brim with lawns, lakes, and woodlands, figuring out just where to start off here can be a bit of a head-scratcher. Of course, there's no right or wrong way to set out on a stroll through Central Park – the simple act of ambling about, wandering from one delightful section to the next, will surely reward you with spontaneous and delightful discoveries. But for those of you who prefer a plan, you should aim to take in as many as you can of these 9 Places You Need to See in Central Park. 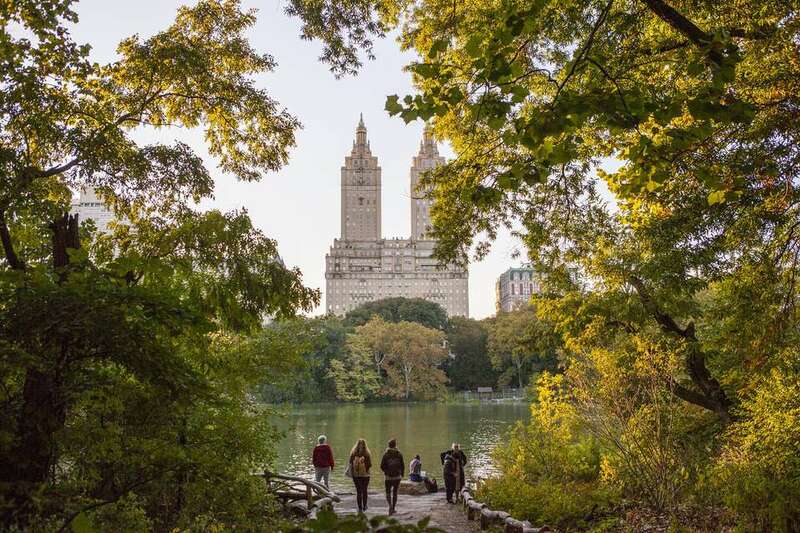 Simply review or print out a good Central Park map (the official one can be downloaded from the park's website), and get ready to hit up some of the park's most unmissable highlights. One great place to start is the Great Lawn (mid-park, from 81st to 85th sts. ), located just behind the Metropolitan Museum of Art. In the summer, the vast lawn plays hosts to a slate of (mostly free) concerts and special events via the Summerstage series, including performances from the likes of the New York Philharmonic and the Metropolitan Opera. Nearby, the four-acre landscaped Shakespeare Garden (W. 79th St.) showcases flowers and plants featured in the poems and plays of the Bard. For a great vista out over the park and city, climb atop the Belvedere Castle (mid-park at 79th St.), a miniature stone castle dating to 1869. Stop off for a light lunch or snack at the Loeb Boathouse (near 74th St.), with its lovely terrace overlooking the lake. Follow that up by renting a rowboat here – or booking a ride in an authentic Venetian gondola – to get out on the lake for a leisurely paddle. Back on the ground, circle around to the Bethesda Terrace (E. 72nd St.): Designed as one of the park's main architectural features, it offers a grand terrace overlooking the lake and the Mall, along with the angel-topped Bethesda Fountain. Work your way around the north side (around W. 69th St.) of Sheep Meadow, a rolling lawn that doubles as one of the park's most popular spots for picnics and sunbathing, before making way for Strawberry Fields, a memorial to John Lennon, who lived in the nearby Dakota building (at W. 72nd St., where you can also exit the park). The black-and-white mosaic there, inscribed with the word "Imagine," is one of the most photographed spots in the park and makes for a perfect finale to a pleasant day spent exploring Central Park. For shopaholics and dedicated sightseers alike, Midtown's storied stretch along 5th Avenue, particularly the section between Rockefeller Center and Central Park, offers more than enough diversion to appease both types of travelers. Lined with skyscraping towers and big-name designer shops, walkers here can kick things off at the outdoor plaza of the art deco Rockefeller Center, a business, retail, and entertainment complex comprising more than a dozen buildings and plenty more shops, situated mainly between 49th and 50th streets (on the west side of 5th Avenue). If you're here during the Christmas season, you'll find one of the most stunning holiday displays in town (including its famous towering tree) at Rockefeller Center, along with a seasonal ice-skating rink. Any time of year, you can pop into the soaring 30 Rockefeller Plaza building (where Saturday Night Live, Late Night with Jimmy Fallon, and other NBC shows are filmed), which is capped by attractions like the Top of the Rock observatory and the famous Rainbow Room lounge. Across the street, kick off some well-heeled retail therapy at the 10-story-tall flagship Saks Fifth Avenue store (between 49th and 50th sts. ), just one of the boutique highlights on what many consider to be the city's best high-end shopping strip. A few of the others to look out for: Versace (between 51st and 52nd sts. ), Henri Bendel (at 56th St.), Tiffany & Co. (at 57th St.), and Bergdorf Goodman (at 58th St.). Bonus: If you're visiting during the holidays, you can expect a special treat with most of these shop windows boasting wonderfully decorated store windows, too. Another notable 5th Avenue attraction is St. Patrick's Cathedral (between E. 50th and E. 51st sts. ), one of the nation's biggest and most famous Catholic cathedrals, dating to 1878. It's open to the public and free to enter. Just keep in mind that access to the stretch of 5th Avenue surrounding Trump Tower (at E. 56th St.), the president's NYC residence and where the First Lady currently resides, is subject to added security checks for the time being; plan accordingly. With all of its concrete jungles, it's easy to forget that Manhattan is actually an island, which is why a riverfront stroll along Hudson River Park – and its namesake Hudson River that it runs alongside – is one of the best reminders of the city's water-fringed status. The 550-acre riverside park stretches along Manhattan's west side, from W. 59th Street down to Battery Place. Each part of the park has its own charm, but we're especially keen on strolling the section that borders the Chelsea neighborhood. The south side of this particular strip comes anchored on the sprawling Chelsea Piers sporting-and-entertainment complex (between W. 17th and W. 22nd sts. ), bustling with diversions like a batting cage, golf range, bowling alley, fitness center, and more. While here, consider setting out for a sail along the Hudson and into New York Harbor from the adjacent marina; we especially love the masted schooners from Classic Harbor Line. At W. 22nd Street, Pier 62 comes with acres of landscaped trees and gardens, along with a skate park and carousel for the kids. Around Pier 63 and Pier 64 (between W. 22nd and W. 24th sts. ), you'll find expansive green lawns that are perfect for sunbathing, while the Chelsea Waterside Park at W. 23rd Street offers dogs and children in tow play areas all their own. At Pier 66 Maritime (W. 26th St.), refuel on some tasty grub and cold beverages at the Frying Pan, an incredibly popular barge-top bar and grill; you can also explore the remnants of a docked 1920s lightship vessel here that was dredged up from the Chesapeake Bay. Just next door, at Pier 66, a boathouse offers non-motorized boating opportunities in season including sailing lessons from Hudson River Community Sailing, outrigger canoeing outings via NY Outrigger, and kayak trips with NY River Sports. One of New York City's most beloved public projects, the transformative, 2009-debuted High Line is an elevated park that served to brilliantly reclaim an abandoned train trestle as public space and to help revitalize Manhattan's West Side. The 30-foot-high park stretches for nearly 1.5 miles from Gansevoort Street in the Meatpacking District to its newest (and final) section near the Hudson Yards development (at 34th St. and 12th Ave.). Start off your stroll at Gansevoort Street and plan to take in these 10 Highlights Along the High Line en route, kicking off with the Tiffany & Co. Foundation Overlook, which puts forth sweeping views over the trendy Meatpacking District below, as well as the neighboring Renzo Piano-designed Whitney Museum of American Art. All along the way, you'll take in modern architecture and art installations, and can pause to soak it all in at spots like the Diller–von Furstenberg Sundeck (between W. 14th & W. 15th sts. ), the 10th Avenue Square and Overlook (W. 17th St.), and the 23rd Street Lawn.